All day long, actually. We went downtown to Liberty Square, where the Mangelica Festival (pronounced mongaleetza) was being held. What is a Mangelica? And also these. 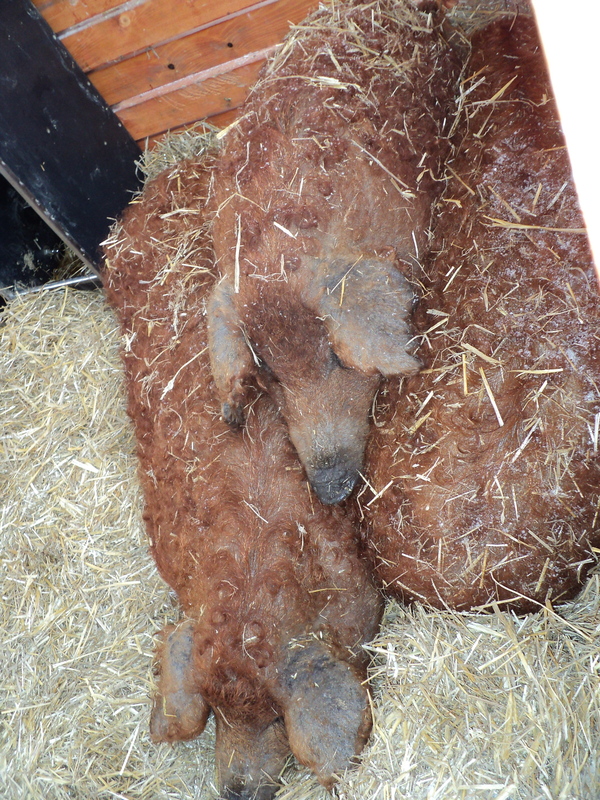 They’re special Hungarian pigs responsible for the truly amazing sausage here. 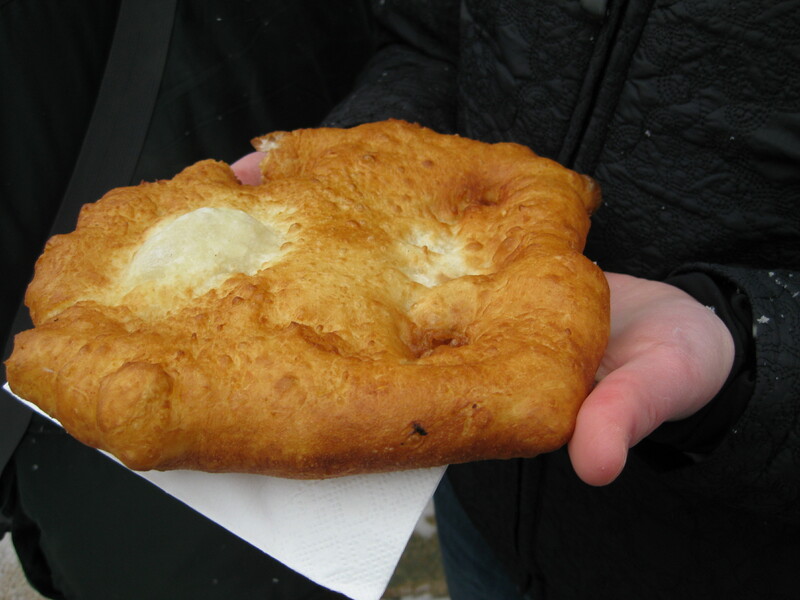 It was about -10°C and we were freezing, so Hannah and I split a lángos, which is essentially yeast-dough frybread. Traditionally it is served with sour cream and cheese, but we were so cold, we just ate ours plain and hot. 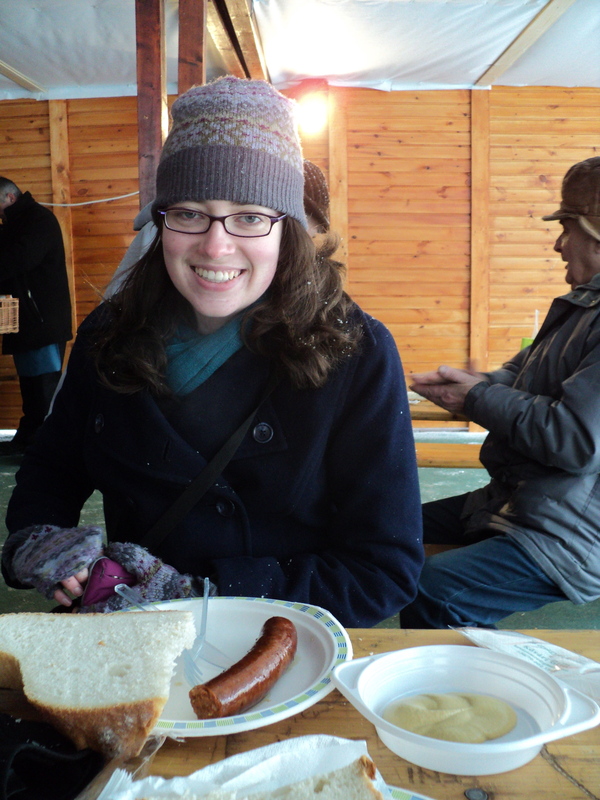 We also sampled the Mangalica sausage, which came with giant chunks of bread and amazing mustard. It was a fun day, and I would love to go back tomorrow if it’s any warmer. 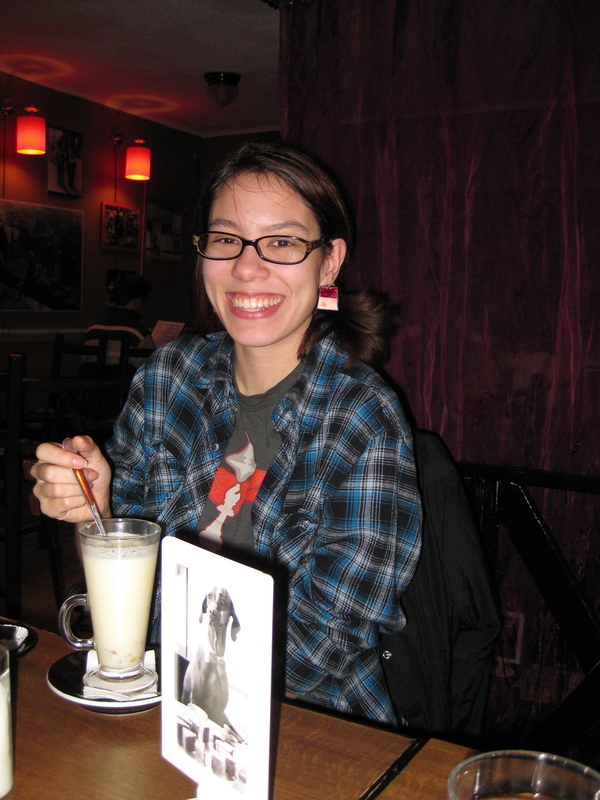 Another fun thing from this week: the chocolate and pálinka tasting! 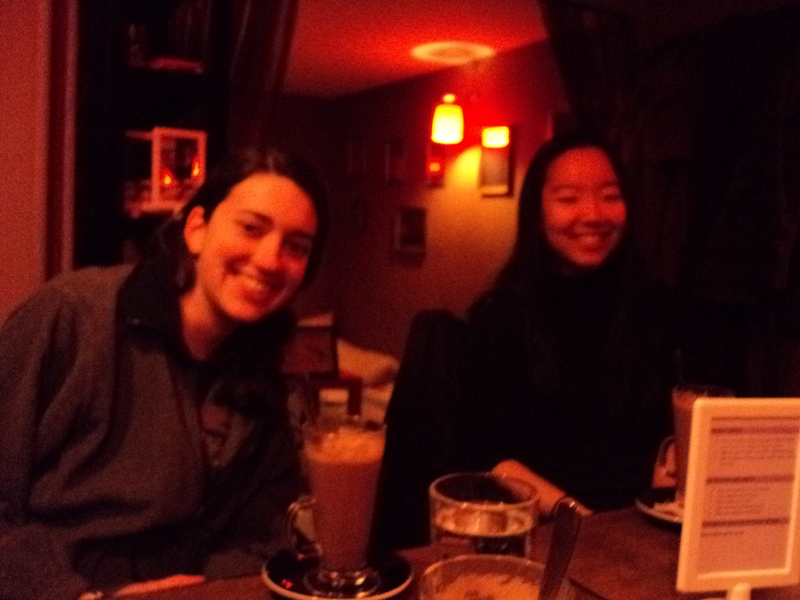 Four of us met up on Thursday evening at this chocolate cafe near Kálvin Tér. 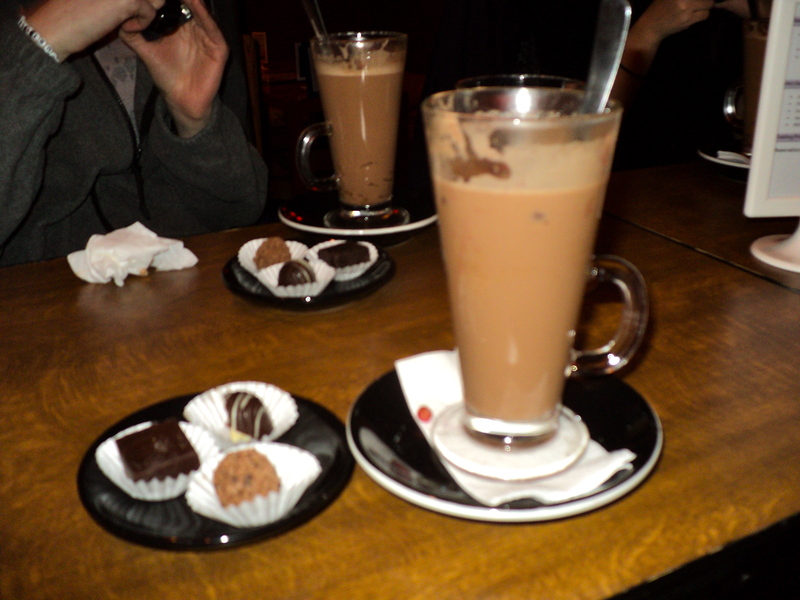 We were served a cup of hot chocolate & pálinka each, plus three small chocolates. milk chocolate with grape pálinka and raisins. Mine was made with cherries. It was so delicious! The chocolate was just sweet enough, and the cherry flavor was really intense. I am going to try to buy some to bring home later. 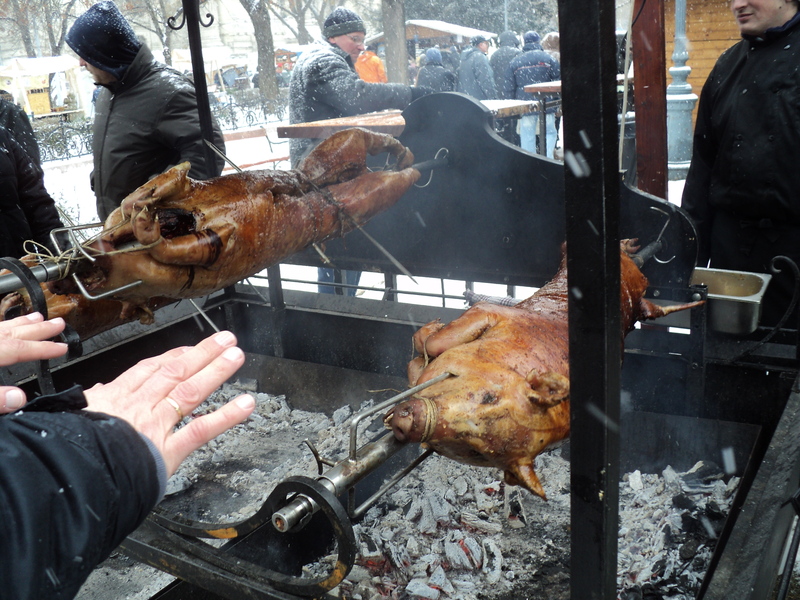 Budapest semester in Food? I thought it was math. We’re all drooling over here. But food does make for much better pictures than math equations so please go on keeping us posted on all your exciting taste experiences! 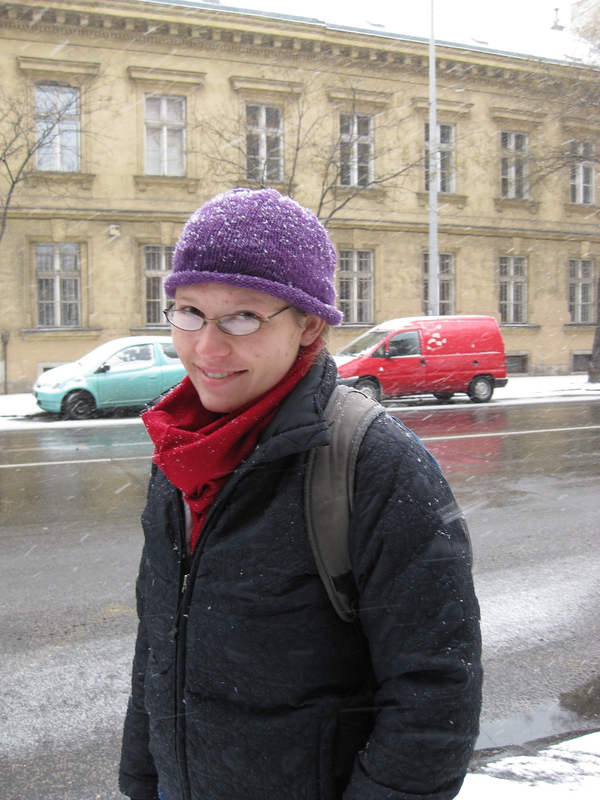 We are immensely enjoying your account of life in Budapest. The food sounds great; we couldn’t play the music, but guess you enjoyed it. By the way, the early Magyars were celebrated horsemen; one of their great raids swept completely around the Alps: through northern Italy, eastern France, and southern Germany. We hope that, as the weather improves, you will do some riding on the celebrated Hungarian plains. All our very Best Wishes, and keep up the good work.